I always like to watch Unboxing, Preview and Review Videos on Youtube and Photos of those sleek high-end smartphones which is great for having a better image of the mobile phone from different angle. But when it comes to the size, it can still be difficult to know how the real size of the devices in real life even the size dimensions are provided. Phone-size.com provides the actual image size (1:1) comparison between phones. Apple, Blackberry, Dell, Google, HTC, Huawei, LG, Motorola, Nokia, Pantech, Samsung, Sony Ericsson, Verzo, and ZTE smartphones are available in the list. All you need to do is input screen type and size of your monitor and you will have all the phone images showing in real size on monitor screen. 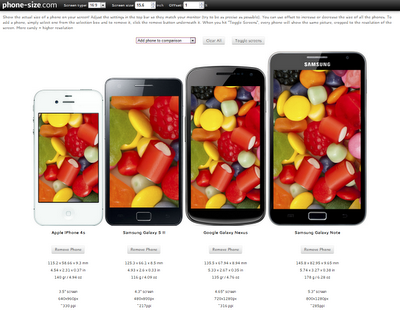 For me, the phone image on the screen doesn't match my phone after I entered my monitor screen type and size. So I have to tweak a bit by increasing 1% in Offset to match my phone perfectly. Click the "Toggle Screens" button will have all phones displaying the same picture. The more candy on the display, the higher resolution it is. Highster spy app has features that can help find out the truth about a person, you can view his/her photos, read messages, just have a glimpse at weblink to find more about such apps.